Ok, so about 4 years ago I was getting ready to take a pic of my DD sleeping when she woke up and gave me that look. I ran across this pic the other day and the first thought that came to my mind was a quote from the Queen of Hearts; "Off with your head!". A page is born....off I went trying to find elements from Alice in Wonderland. Of course I think that Helena Bonham Carter's new version of the royal lady is fabulous. So I searched for images on Google. While I was looking through images from the film I saw pics of flowers that had faces and thought I had to make some of those. Then I came across this great little pic of the Mad Hatter on a pocket watch dial and had to have that too! I have to tell you that I drew a page lay out map including all of the handmade goodies I wanted to add. The page you see before you is not entirely what I drew or all that I made. This page has morphed about a dozen times. I had my DD make funny faces while I took pics and then used my camera/photo editing software and messed with the RGB settings to get the colored photos. I handmade the carnations out of matching colors and distressed and curled the edges. The flowers actually ended up being too puffy and I had to flatten them out a bit. I used grunge board butterfly wings and distressed those and used rock candy stickles to give them a shimmery, sugary look. I used the same stickles to glue the pic of the mad hatter to an acrylic circle and glued them to the wings. I used an SVG file and my cricut once again to cut out the frame. I used red brick and black soot distress inks on it and then used clear embossing powder to give it a leathery look. Which is kind of does up close. I cut my DD out of her photo and found a heart themed paper to put behind her. 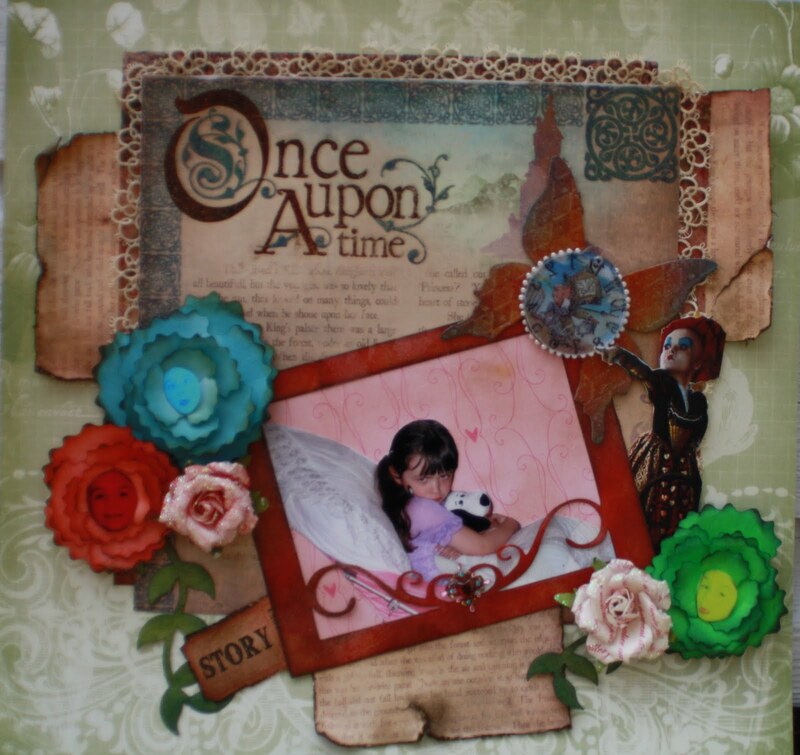 I used paper from my Once Upon a Time stack for the background as well as the book pages. I of course, distressed those. One of my favorite objects on this page his handmade lace that my DH Grandmother made when she was a teenager (pre-1920). It is fabulous and I decided that it is too pretty to keep in my sewing box, so I added it to my page. I think she would be pleased.